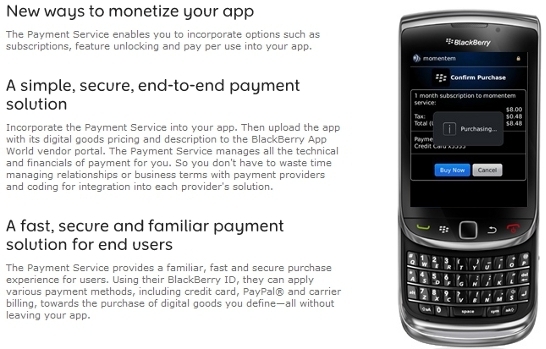 BlackBerry has launched a new version of the BlackBerry Payment Service SDK making it version 1.5. It is built on the previous API and will allow developers to offer auto-renewing subscriptions for applications and in-application digital goods. As it is build on the API of version 1.0, developers will not have to struggle with the API the new SDK will allow developers to quickly add subscriptions. The new SDK also provides APIs to check for the status of a subscription and the ability to cancel subscriptions. BlackBerry Payment Service will manage subscription renewals automatically and sends out renewal reminders and receipts to users. Please note that applications with subscription services will require users to have the recently released BlackBerry App World 3.0 installed on their device.